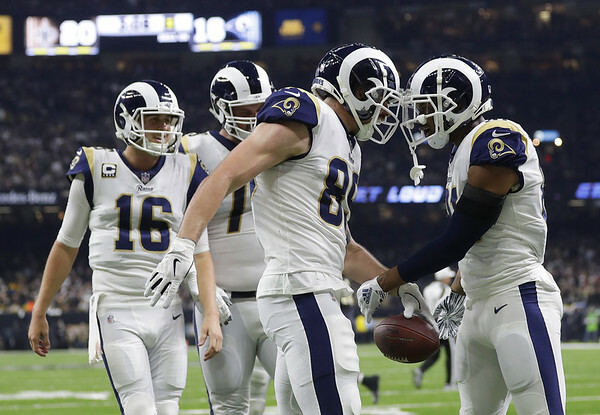 This might seem like a no brainer, but for the Rams, this is going to have to be a key component of their game plan against the Patriots, who have shown an ability during their run to the Super Bowl that they can keep an opposing offense off the field. Against the Chargers in the AFC Divisional Round, New England engineered a 14-play, 83-yard drive, which spanned seven minutes and 11 seconds. Against the Chiefs in the AFC Championship game, the Patriots used a 15-play, 50-yard drive that ate up the first six minutes and 55 seconds. Both the Chargers and Kansas City ended up playing from behind the rest of those games. With that in mind, Los Angeles needs to not only have quarterback Jared Goff throw the ball well, it needs to have an effective Todd Gurley. Goff completed 64.9 percent of his passes for 4,688 yards, 32 touchdowns and 12 interceptions during the regular season and just 58.8 percent of his passes for 483 yards, one touchdown and one interception in the postseason so far. Both Robert Woods and former Patriot Brandin Cooks caught more than 80 passes for 1,200 yards and five touchdowns. Gurley ran for 1,251 yards and 17 scores in the regular season, but just 125 yards and two touchdowns in the playoffs, including four carries for 10 yards in the NFC Championship. How Gurley’s knee, which has been an issue this season, holds up remains to be seen, but if it isn’t an issue, it will only be a benefit. C.J. Anderson has shown he can be effective as well, rushing for more yards in each postseason game, but Gurley is in a class by himself. The Rams operate at their best when they can run the ball. This is where Aaron Donald and Ndamukong Suh are going to be vital - to put it lightly - for the Rams. Patriots quarterback Tom Brady has yet to be sacked this postseason and has only faced pressure on just 15.6 percent of his dropbacks, according to Pro Football Focus. That kind of time has allowed New England to average 6.8 yards per play and 39 points per game in its two playoffs games. Donald, on the other hand, hasn’t been able to register a sack in either of the Rams’ last two games after registering 20.5 in the regular season. Suh, meanwhile, has 1.5 sacks in the playoffs, all of which came against New Orleans in the NFC title game. It would be the perfect time for Donald to get going. This point might be cheesy, but at the same time, this quite necessary. Everyone knows the Patriots have been here before. This is Brady’s and head coach Bill Belichick’s ninth run at a title together. The last time the Rams were playing for a Super Bowl was when Hall of Famer Kurt Warner was the quarterback and the Greatest Show on Turf lost to none other than Brady and Belichick 17 years ago. The rest is history. Los Angeles has shown this season it can play with the best teams. The Rams averaged 6.4 yards per play and 32.9 points per game in the regular season. Posted in Newington Town Crier, General Sports on Friday, 1 February 2019 22:06. Updated: Friday, 1 February 2019 22:09.